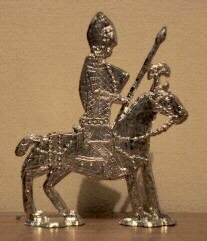 Fig 1: Extant pewter horse. 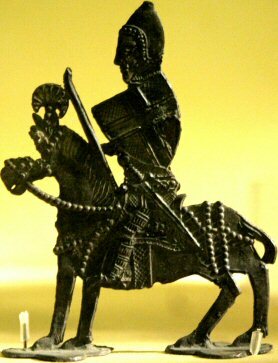 This cast base-metal figure of a knight on horseback comes from 14th-century France. It was discovered in the Seine river, and is now held in the Musee national du Moyen Age (Museum of the Middle Ages) in Paris. Base-metal is a lead-tin alloy (a low-quality pewter). Modern pewter usually does not contain lead, and our reproduction has been cast with lead-free pewter. The original is dated to approximately 1370, although the armour depicted is more appropriate to the first half of the century. 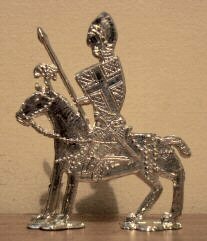 The toy knight wears a bascinet, which would have been worn with a great helm over the top. The studs on the bascinet are the vavail, which would have a leather strip going through them to hold on the chainmail. The knight's legs are mail with poleyns (no fans), and the feet are simply covered in mail. The device is a cross with hatching on the field. 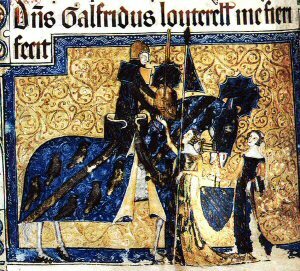 An illumination from the Luttrell Psalter of Sir Geoffrey, dated to around 1340 (Backhouse p6), shows him wearing very similar armour, and the restored toy lance has been based on Sir Geoffrey's. 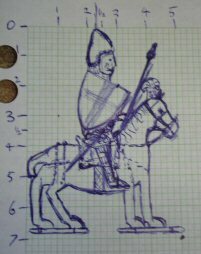 The cast horse is is mostly flat, except for the barding, face and tail, and is out of proportion to the size of the knight. The thickness of the figure, the original length of the lance, and the appearance of the underside of the quatrefoil stands are unknown. Fig 2: Image from the Luttrell Psalter. 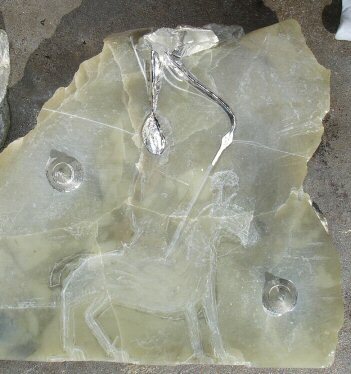 Our reproduction has been cast using a three-piece soapstone mould, cut and smoothed by hand, keeping as close as possible to the original size (67mm tall x 51 mm wide). Garrett mentions that these types of mounted flat lead figures are one sided, however this contradicts a photo in Fraser of the exact same figure, complete with all the exact same blemishes, and showing the opposite side of the figure. Fig 3: Rough sketch to size, but showing a mirror image of the original to help with carving the mold. 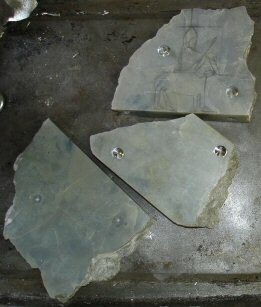 Fig 4: Three-piece mold, featuring the sketch transferred to bare stone. 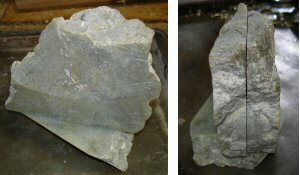 Fig 5: Three pieces, showing guide points. 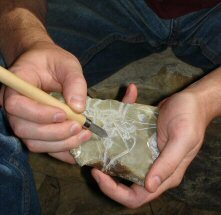 The points are made by drilling through one piece of soapstone into the other, and carving the depression into a cone shape, then pouring pewter in to fill the hole. Fig 6: Front and side views of the three-piece mold fitted together. Fig 7: An early cast. 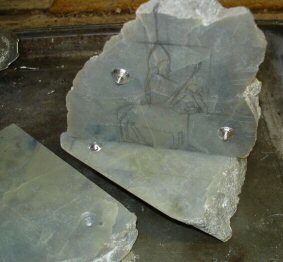 With each cast, more of the second side of the figure was able to be carved from the soapstone mold. Fig 8: Carving the soapstone mold using linocut tools. Fig 9: Detail of sword-side of replica. Fig 10: Detail of front view of replica. The piece is essentially flat. Fig 11: Detail of shield-side of replica. Fig 12: Twenty-three horses, looking very effective on-mass. Thanks to Jean Christophe Ton-That of the Musee nationale du Moyen Age. Thanks to Sir Cornelius von Beck, for advice on the armour. Garratt, John G., Model Soldiers; A Collector's Guide, Second Edition, Seeley Service & Co., London, 1965. Fraser, Antonia, A History of Toys, The Hamlyn Publishing Group Limited, London, 1972 (1st Ed. 1966). Backhouse, Janet, Medieval Rural Life in the Luttrell Psalter, The British Library, London, 2000. Photo of original by Robyn Spencer, 2006. Luttrell Psalter image from the British Library, 2007. All other photos by the authors, 2007. Copyright Jaysen and India Ollerenshaw 2007. Free use for non-profit.